Does ET inhabit the Star Wars universe? There is a Scene in Spielberg’s ET where our beloved Alien is walking down the street on his way to a Halloween party. He has a white sheet over him and sees the world through the two holes cut out in the sheet. He sees a young child dressed up as Yoda. Immediately ET points to him and says the word ‘Home’. This begs the question, does ET recognise Yoda because as a species, they inhabit the same universe? In Star Wars Episode 1, the Galactic Senate plays an important role. Various creatures are represented with each species sitting in their individual pods within the debating chamber. And lo and behold, If you look closely you can see a specific pod, containing three creatures. (As seen in the picture) They are of the same species as ET. 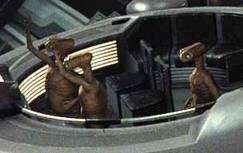 According to Wookipaedia, the online Star Wars reference tool, the species is known as ‘The Children of the Green Planet’. Perhaps that is why ET and his cohorts have such fascination with earths Flora and Ferna at the beginning of the film ET. The ‘Green’ planet is no doubt richly populated with dense vegetation. As is the Planet ‘Dagobah,’ which any Star Wars geek knows is the planet that Yoda went in to Exile on. Are they one and the same? You never know….